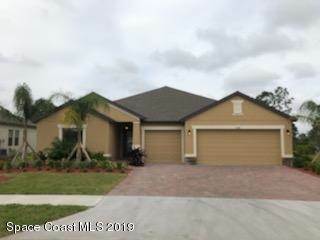 **NEW HOME CONSTRUCTION - READY IN FEBRUARY** Beautiful 4 bedroom, 3.5 bathroom, 3 car garage home is located in the gated Sawgrass Lakes Estates community. This home features upgraded quartz countertops, ceramic tile flooring, upgraded 42'' upper cabinets with crown molding in the kitchen, stainless steel kitchen appliances (dishwasher, microwave, smooth top range), crystalline glass front door, brick paver driveway, storm shutters and more! This energy efficient home includes a 10 year structural warranty. Located just minutes away from I-95! Directions:I-95 to Palm Bay Rd exit 173.Head west to Norfolk Parkway and make a right. Continue across Minton Rd into Sawgrass Lakes community entrance. SchoolsClick map icons below to view information for schools near 3620 Salt Marsh Circle West Melbourne, FL 32904.